Most of you have heard of the hot sultry "dog days of summer". Well, where I live we also have the long lazy "frog days of summer". The tree frogs are abundant here and make their presence known by just "hanging around" all day doing absolutely nothing. I feel this way on many hot summer days. I spend many summer evenings sitting on my porch with a good book or art magazine. I thought it would be fun to make a tray for my sun room which could hold some lightly scented candles (or whatever). Since I love frogs so much, I chose to make it with a "frog" theme. 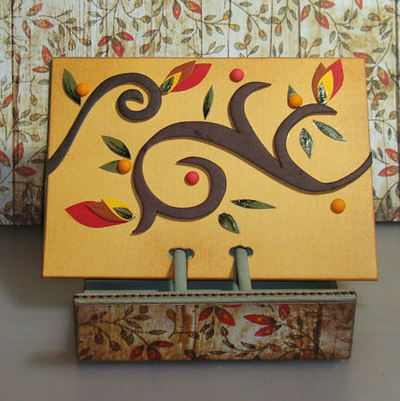 I started off by painting a shallow wooden tray from Glue Art & Paper Studios in a soft orange. I covered the tray with coordinating frog/poppy themed paper from Creative Imaginations. I painted game tokens bright orange and added them as feet to the tray. The corners of the tray were embellished with clear buttons that I topped off with punched images from the patterned paper. These clear acrylic buttons really add some luminosity and reflection that this photo just doesn't pick up. I also added the words "dogs days of summer" to the tray, along with a cute 3-D paper frog. I hope that you enjoyed this project. I really like using products from Glue Art & Paper Studios. I encourage you to check them out. They have a wide range of items... with endless possibilities. And, the quality and service is great. Happy "frog days of summer"!!! This month for my Glue, Art & Paper project, I personalized one of the newer small sized vertical albums especially for one of my other "hobbies"... playing cards/games. I love to play cards and board games. On occasion I play cards with a group of friends. We always play a game where each hand played is different than the one before it. We are constantly asking "which hand we are playing now?". This size of vertical album is perfect for displaying the list of hands for our game. It is small enough to sit on the table and not get in our way. Now, no one needs to ask "what hand is it". Instead they can just quickly look at this handy piece. The vertical album that I used holds pages approximately 3" x 3". It is perfect for holding a favorite photo, a meaningful personal quote or verse, important phone numbers or dates, etc.. It is a great compact and practical size. It is perfect for a desktop or anywhere you may have limited space. There are so many uses for it. Just personalize it to your likes and needs. The possibilities are endless. My vertical album has a front "cover" so that when not in use during a game of cards, it can sit on a shelf as an attractive display piece. No one would ever know what it's actual use is. Behind the cover, I included the list of hands for both the quick and long versions of our card game, and the basic rules for each. Each version is "tabbed" at the bottom. To make this vertical album, I first painted it with acrylic paint. I then applied ribbon to the edges of the upright pieces. I applied coordinating paper strips to the edge of the base. I embellished with Prima flowers and bling. 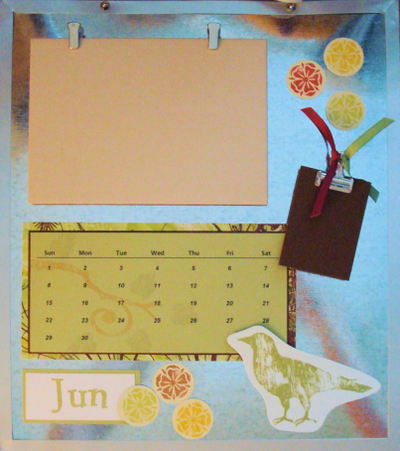 The front "cover" is a piece of Memory Box printed paper, with a bird image stamped onto it (StampinUp!). The interior pages were printed on the computer and stamped with some swirly images (StampinUp!). 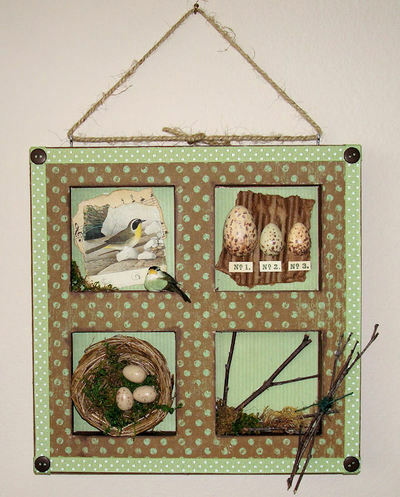 This wall hanging was so much fun to create. I have it hanging in my house right now!! My friends know that I have always been a bird freak, so it was very fitting of me to make something "bird" themed. I debated on whether to make a nice jewelry tray for my bedroom, or this wall hanging. It was a hard choice (although I will probably still make my "tropical" themed tray too). I guess the nature side of me won out. It all started with an unfinished wooden 4-compartment tray from Glue, Art & Paper Studio. I decided to make this tray into a dimensional wall hanging. I started out by lightly sanding the tray, and painting it with a base coat and then a solid coat of brown paint. After that dried, I adhered a piece of polka dotted paper to the top surface, trimming out the open squares once the glue was dry. Squares of a muted green striped paper were added to the back of each open square. Once the "construction" basics were done, I was ready to alter this into my own little personal "birdie heaven". 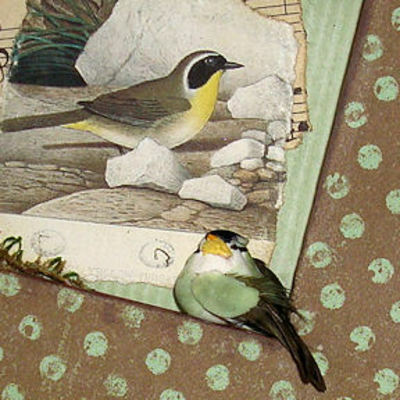 I tore out a piece of a bird illustration, and a piece of sheet music and added it to the first square. A little moss was added, as was a small green "mushroom" bird sitting on the ledge. In the next square, I took a piece of corrugated cardboard and tore off the paper on one side of it. I tore the piece to shape. I inked it up with some brown ink. The eggs are flat sided wooden eggs that I painted to look like real eggs. 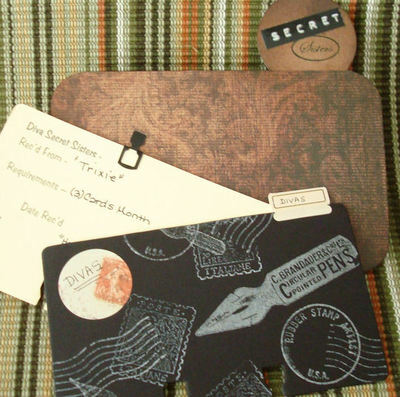 I stamped labels using stamps from Purple Onion Designs. 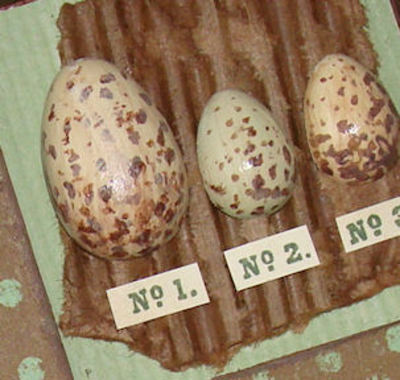 The third square is a birds nest lined with some moss and bird eggs. 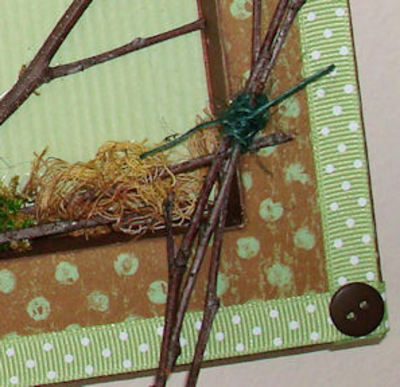 In the fourth square, I simply added tree branches and twigs, along with a little moss and some walnut ink dyed cheesecloth. All of the things little birds need for making a nest. I tied a little bundle of twigs together and attached to the corner. The final touches included putting a polka dotted ribbon around the edge of the wall hanging. Also, I added a brown button to each corner. Some eye hooks were added to the top edge and twine was used as the hanger. I hope you enjoyed visiting my little "bird heaven". My niece Mandi recently got engaged and will be having an outdoor wedding in early fall. She has chosen persimmon and brown as the colors of her wedding. A beautiful choice of colors for a beautiful time of year. 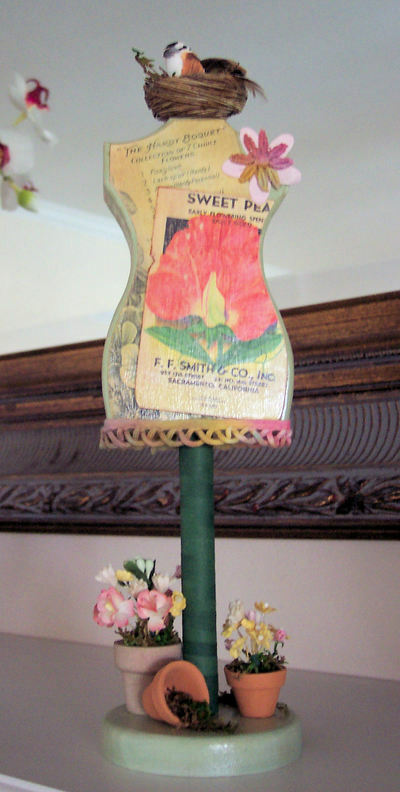 As a gift, I decided to personalize a 2-tier cupcake stand from Glue, Art & Paper Studio for her. Hopefully, she can use it at her bridal shower or some other pre-wedding event. It wasn't difficult to make this stand, although it had a lot of "drying" time involved. I first gave the stand 2 coats of cream colored paint . After that, I cut two circles of printed paper to be used on the surfaces of the stand. I adhered this paper to the stand using a gel medium. Next, I gave the entire stand two coats of a glazing medium . This gave the stand a nice finish. I also took a 4.5" round box with lid, and painted it a chocolate brown color. I wrapped a strip of brown patterned paper around the box and adhered it. I also coated the box with the glaze medium. Note - make sure you let each coat of paint/adhesive/glaze dry thoroughly before moving on. Once the basics were finished, I moved on to the fun part... personalizing the cupcake stand. 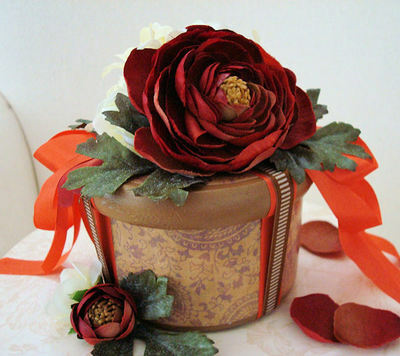 I first took the persimmon colored rayon ribbon and "wrapped" the box like a gift. I wrapped the ribbon on the box and lid ... separately (making sure the ribbon on the lid and box lined up). 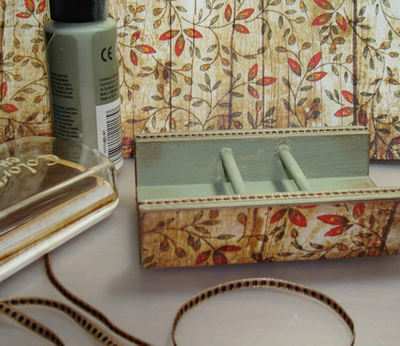 After gluing the lid onto the box, I then wrapped the narrower brown ribbon over the rayon ribbon. I attached multiple loops and streamers of rayon ribbon to the top of the box. Next, I attached the box to the center of the cupcake stand. 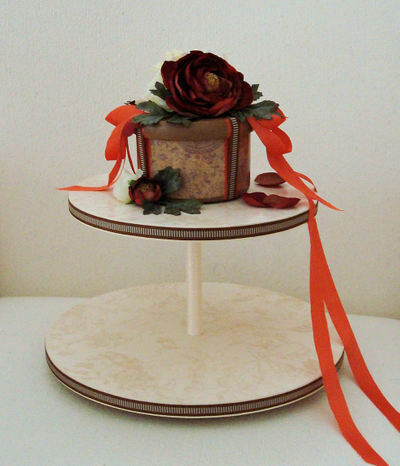 I glued a dark persimmon flower, leaves, and cream colored roses to the top of the box. I added a couple of flower buds and loose petals around the base of the box. This was like putting icing on the cake. I added a strong double sided tape to the back of the brown ribbon and carefully applied the ribbon around the edges of both levels of the cupcake stand, making sure it was perfectly straight. I also wrapped a cream colored satin ribbon around the center pole giving the cupcake stand a final finishing touch. Finishing touches are most important to me, whether it be the way the ribbons are finished off at the ends, or the way in which pieces are lined up. I feel that how an item is "finished" either makes or breaks an art piece. Anyway, I hope my niece enjoys her special cupcake stand. Congratulations Mandi. I have to tell you all, that I LOVE this project! I am so very happy with the results. What it offers me on a daily basis is absolutely priceless. What did I do without this organizer!? Like the front of my organizer reads, "trust your crazy ideas". 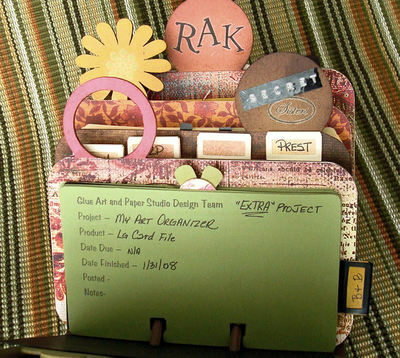 This art organizer started out as an "extra" design team project for Glue Art and Paper Studio. It quickly became a very personal project for me. I created it so that I could keep all of my current design team assignments, art groups, swaps, mingles, secret sisters, magazine submissions, RAK's, etc. organized. I always have so many art projects going on at one time and I have never centrally organized them as to details and due dates for the projects. This art organizer has put everything in one easy location. 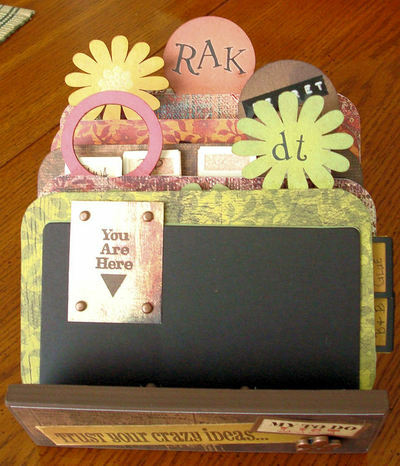 I started out with a Glue Art and Paper Studio standard sized Crafters Card File. 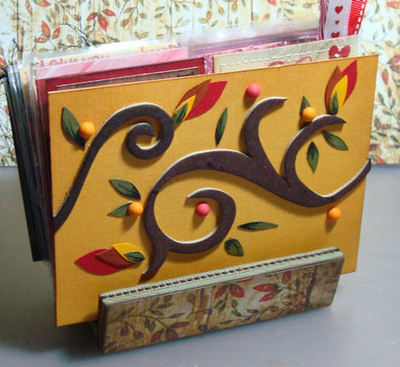 This card file uses roomy 3" x 5" cards (which are available in neutrals and a variety of colors). I also discovered that I can run these larger cards through my printer thus making custom printed file cards. Next, I determined I wanted to divide my art organizer into the following sections (with sub-groups). 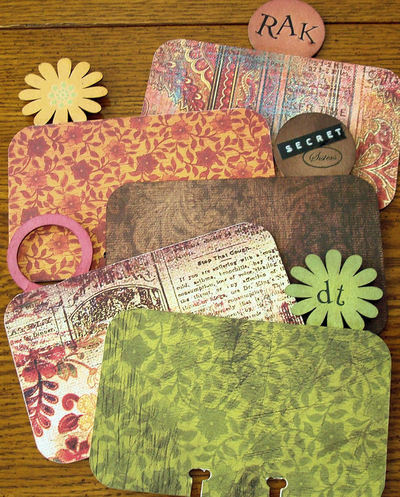 I happened to have a variety of chipboard "tabbed index cards" (flower and circle sets) leftover from a couple of Buzz and Bloom projects. These worked perfectly for my dividers. The chipboard was too thick to put into my card file hole punch, so I traced the holes where I wanted them. I punched 2 large holes with my Cropadile. I cut the vertical slit with a craft knife and also the small piece between the two holes. I inked up the "tab" portion of each chipboard index card. I gave each section a different color. I covered each index card on both sides with coordinating printed paper (Daisy D's). I added titles to some of the tabs and embellished others using tags and rub ons. Let me show you how I organized the first section... "dt" (design team projects). 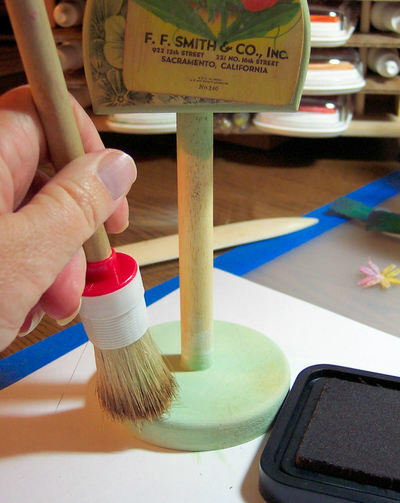 I labeled the green flower tabbed chipboard index card with "dt" using rub ons. 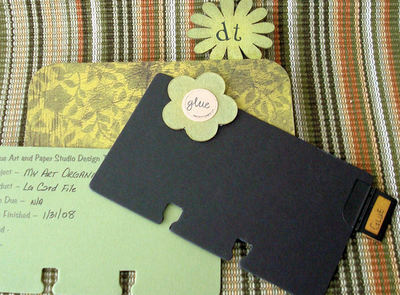 Behind the green "dt" index card, I have two black file cards - one labeled Glue Art & Paper Studio, and another labeled Buzz and Bloom. 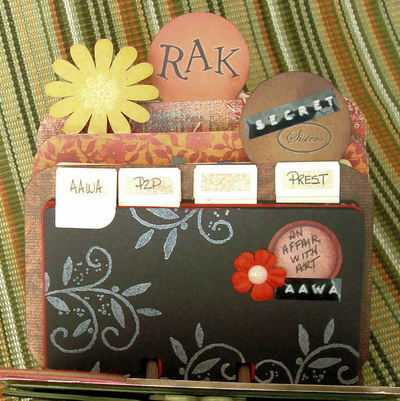 Since I used a flower tabbed index card for this section, I used chipboard flowers as tabs on the black divider cards. I wanted a file card for every design team project. I designed a card on my computer and printed them on my own printer. Some of the detail I wanted to know was ... project, due date, products used, etc. I chose green file cards to coordinate with this section. This is a sampling of my "art group" section (red section). 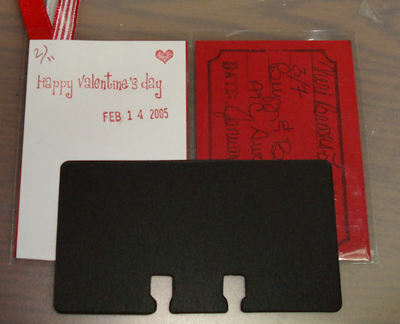 I have black file cards as sub-dividers. Each art group has a metal tab. Behind each stamped black sub-divider is a collection of printed project cards. 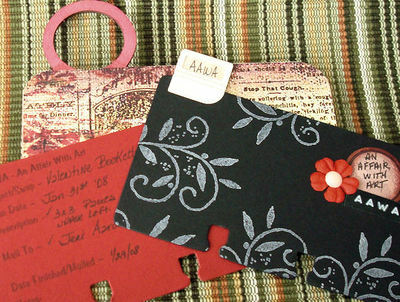 The details on these custom made cards include project/swap/mingle name, hostess name, due date, project description, etc. I made an effort to put alot of personal details and finishing touches into this project. I think it ended up with a lot of "personality". Notice how each section has different types of tabs (metal, chipboard, mini metal, tags, etc. I've used a different yet coordinating color for the file cards within each section (green, kraft, red, marigold, and ivory). 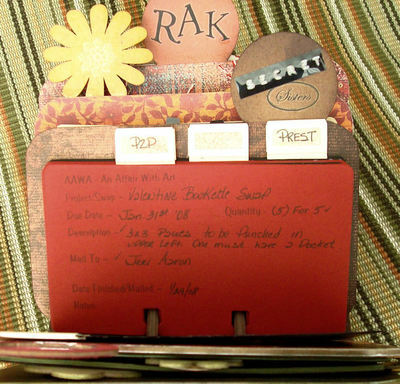 I used the black file cards as sub-dividers throughout the organizer. The black sub-divider pages have been decorated/embellished differently for each section. Since my computer is my first and final stop for almost all of my art projects, I keep this art organizer on my desk. I find that it is the best place for it. This art organizer allows me to put the most urgent/current projects at the front of each section... or pull the file card out and temporarily put it in the very front of the organizer to remind me of a project. The file cards are easily moved about. When I have new art projects, I can immediately write up a new file card for the project. As I get thoughts and ideas, I jot them down on the back of the project file card. I have email and snail mail addresses within reach. 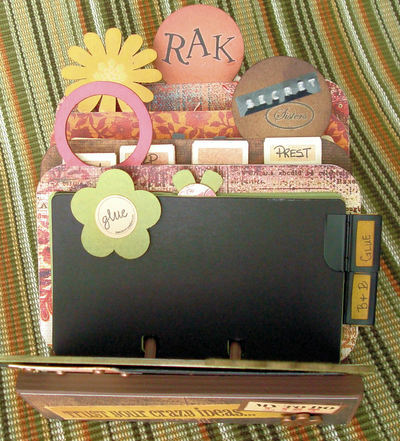 The information contained in this organizer is incredible. This art organizer is expandable too. I can customize it even further in the future. 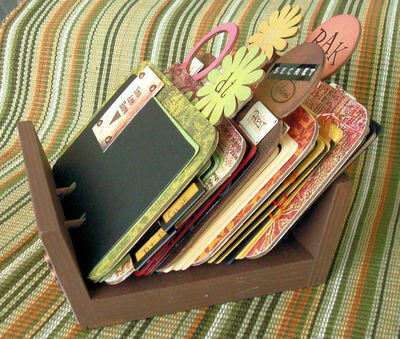 By using the larger of the two sizes of available crafter card files, I have alot of room for expansion. The file cards are also readily available in whatever color I need. If you are anything like me, and can never find the due date of swaps or forget about art projects you commit to, I highly recommend making yourself an art organizer. You can totally personalize it to your home decor and personal needs. Have fun! Here are some more photos I thought I'd share with you. 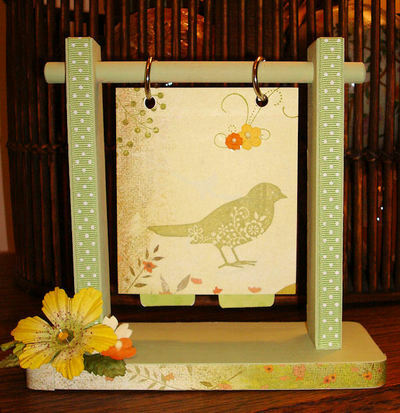 I just completed my most recent project for Glue Art and Paper Studio... it is an ATC Display Holder. This is something that I desperately needed in my art studio. I have boxes of wonderful ATCs that I have collected over the recent years, but I had no means of displaying any quantity of them at one time. This project solved my dilemma. My ATC Display Holder holds 48 ATCs. I chose a vintage looking paper to cover the front and back. I just measured, cut the pieces to size, and glued them to the card file. I aged the entire card file by dabbing my finger in chalk ink, and running it along the sides/edges of the painted card file. This gave it a worn and "used" look. I wanted the card file itself to be simple. I wanted the "cover" and the ATCs to be the focal point of this project. The only embellishment I added to the card file was a narrow strip of brown checked ribbon that I attached along the edge. Next, I created a "cover" for the ATC display holder. I wanted to mimic the design of the patterned paper I had already used. I used a sturdy colored/textured chipboard for the cover. I chose a golden yellow color. To age it, I stippled chalk ink lightly around the the edges of the chipboard panel. 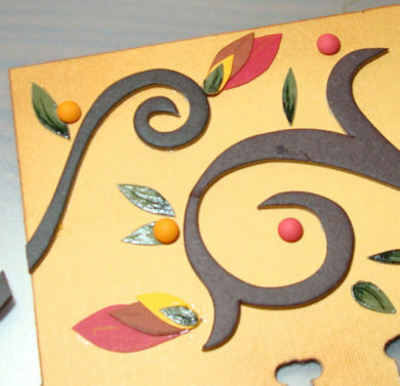 Next, I inked up some chipboard flourishes with chalk ink, and cut leaves out of coordinating solid colored card stock. I inked in leaf marks and glazed the green leaves. I layed out a design that was pleasing to my eye, and glued it to the chipboard. I added some dimensional dots to further embellish the cover. Tip - I needed to create slots at the bottom edge of the thick chipboard so that it could slide on the dowels of the mini card file. I accomplished this by first tracing the cutouts from an actual file card. Then I punched three large overlapping holes side by side with my Cropadile. I cut the straight slots with with a craft knife. 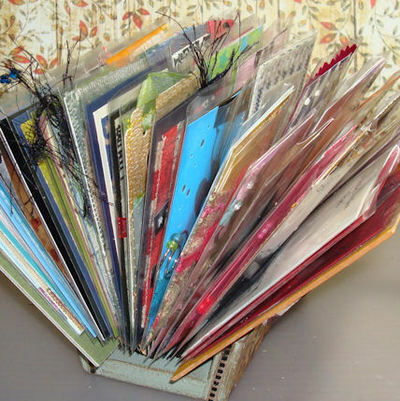 To create the pages that hold the ATCs, I took 24 mini file cards (from Glue Art and Paper Studio) and attached clear baseball card sleeves to them. I simply took each file card and ran adhesive along the top edge of it. I layed two clear sleeves side by side with their bottom edge just above the cutout slots. I then inserted the ATCs into the open end (top) of each sleeve. By using the clear sleeves, I can easily move around or change the ATCs. For example, I currently have mostly Valentine themed ATCs on display right now. The information on the backs of the ATCs is easily accessible. And, it allows me to display my treasured ATCs without disturbing any of their original integrity. They are left 100% in their original form. 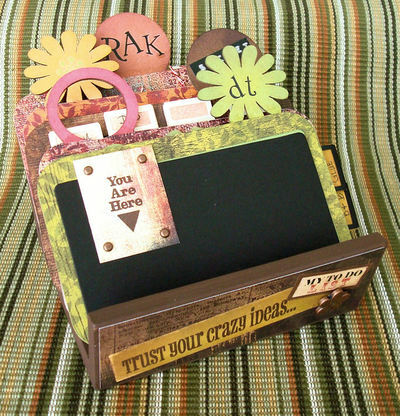 I thought of many other things I could do with this Mini Card File.... an address holder, art friend info file, perpetual birthday calendar, recipe holder, garden journal, etc. The ideas and uses are endless. 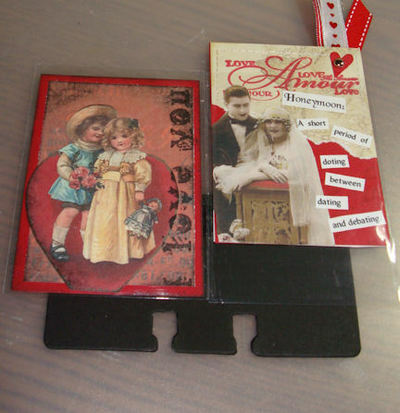 This ATC Display Holder could also be made using the larger Standard Card File from Glue Art and Paper Studio. I would think you could easily hold 150 ATCs by using it. 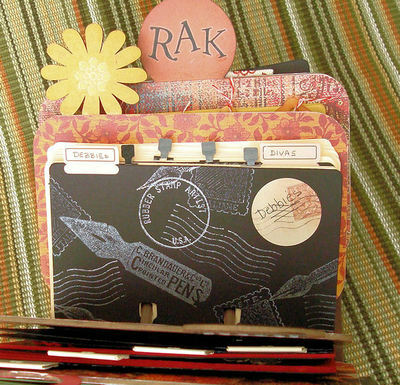 With that size, I'd recommend adding tabbed dividers to sort your ATCs by theme, swap, color, artist, etc. Thank you to all of my wonderful artistic friends for all of the beautiful ATCs you have shared with me. I am proud to display them. They continually inspire me with just a glance. Please be sure to check out the wonderful projects by the Glue Art and Paper Studio Design Team. With the start of the new year, it was time to make myself a new 2008 calendar. I had a couple of personal requirements. I wanted it to be color coordinated with my home, be functional and durable, and it had to look "nice". Here is what I came up with... a magnetic calendar. This was really quite simple and fun to make. The very first thing I did was to decide what color scheme I was going to use. I decided on a palette of browns, greens, sunflower, and a bit of cinnamon. 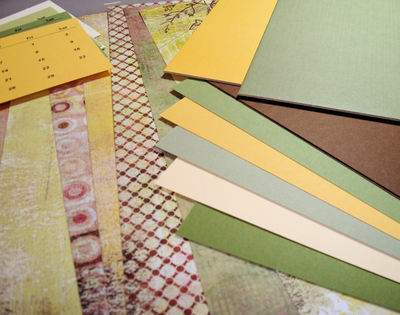 I chose printed papers from Basic Grey (Fusion) that would compliment the palette. I cut a piece of metal flashing and inserted it into the metal frame in place of the glass that came with it. The metal cuts easily with a good pair of utility scissors or tin snips. I attached two hanging clips to the top of the frame with my Cropadile. I put the frame back together making sure it was snug with all of the cardboard and filler that came with it. The magnet board was ready to hang on the frame. 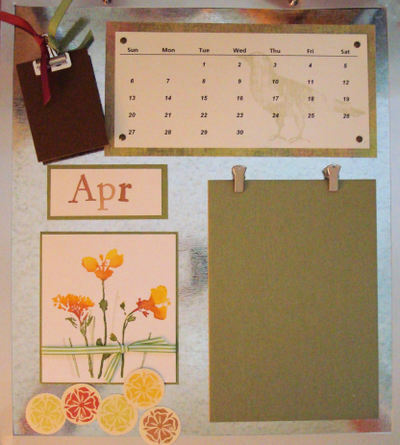 Next, I made all of the components for my calendar. 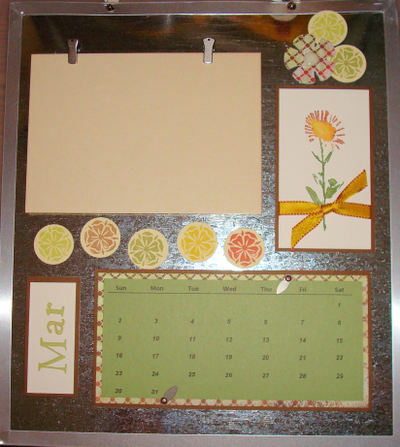 I needed to make a calendar for each month, month names, and some decorative elements to use on the magnetic board. I envisioned having a lot of magnetic elements available to me to use at the beginning of each month when I set up that months calendar. I wanted to be able to interchange everything, using items in different spots on my board, and for whatever month I wanted. I wanted to be able to make more magnetic elements as time goes by, and to reuse the calendar months from year to year (with only a couple of new ones to make in each new year). I printed a calendar for each month. 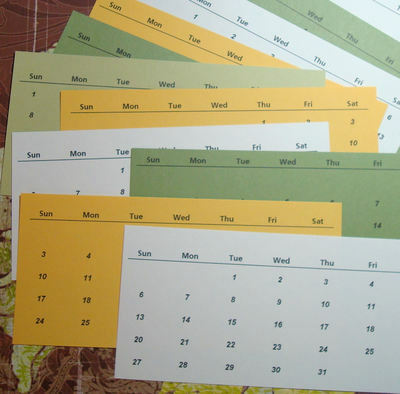 You can print calendars from many free sites, but I made mine using Excel. I just printed them randomly on different colored card stock. I stamped some of them with soft images and layered them onto printed paper and colored card stock. 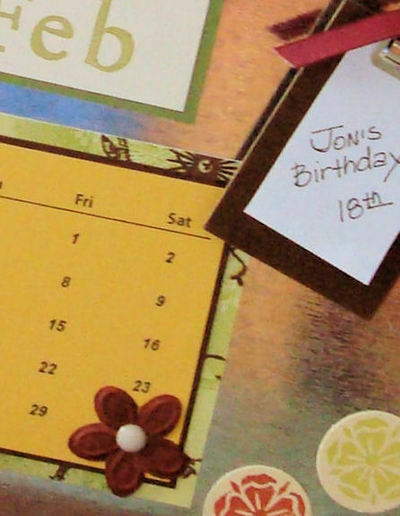 I embellished some of the calendar months with mini brads, prima flowers, and photo turns. 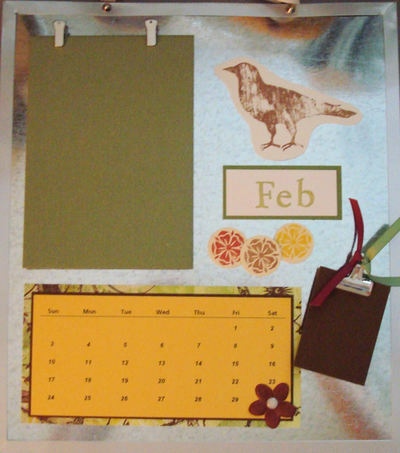 I attached the calendars to the magnetic sheets and trimmed them with my rotary trimmer. 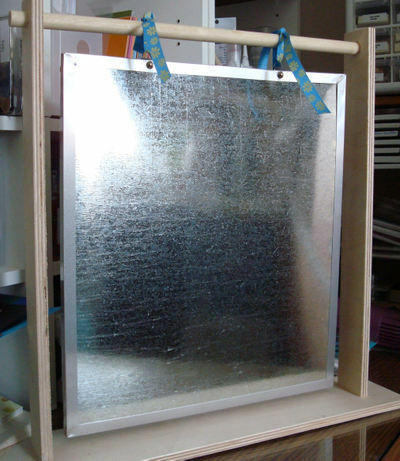 The magnetic sheets are very thin and flexible. 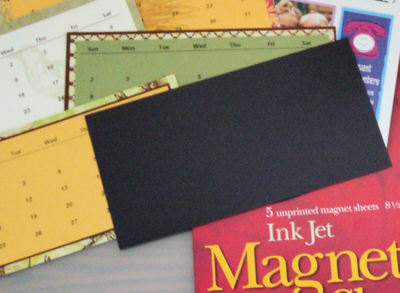 Some magnetic sheets come with adhesive already on them, and others you need to add adhesive. I had to add adhesive using the xyron. 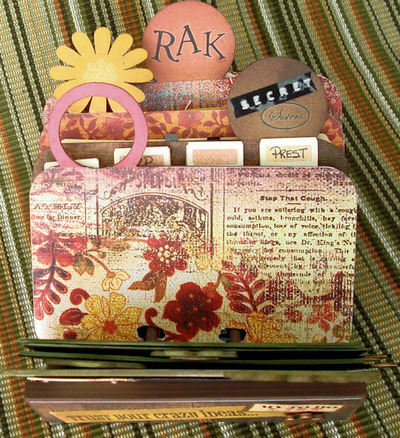 Each months name was stamped on cardstock, using the Garamouche alphabet stamp set from Purple Onion Designs. 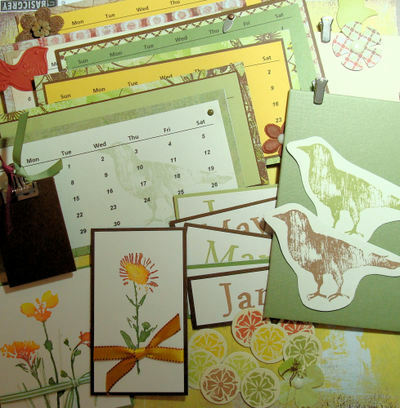 On ivory cardstock, I stamped bird and flower images (Green Pepper Press) using softly colored inks. I wanted the images to be very subtle. I attached them to the magnet sheets. 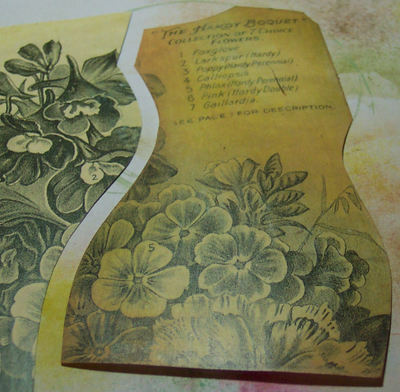 The birds were trimmed with scissors, and the floral images were punched with a circle punch. I also had two pieces of DCWV colored chipboard (beige and green) that I attached dimensional magnets to the back of. I added two little small silver clips to each board. These can be used as a mat for ever changing photos. The clips can be moved so that photos can be turned either direction (landscape/portrait). In addition, I took a small Formica sample chip, covered it with card stock, added a dimensional magnet to the back, added a small silver clip, and some ribbon. 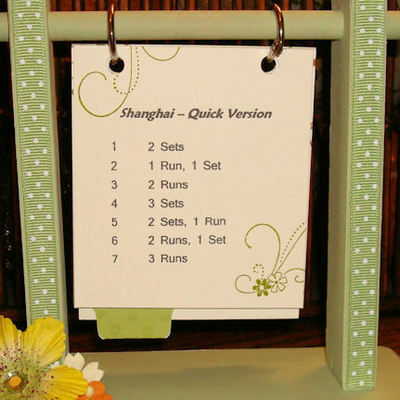 This can be used to announce or remind me of any special occasions... like someones birthday or anniversary. 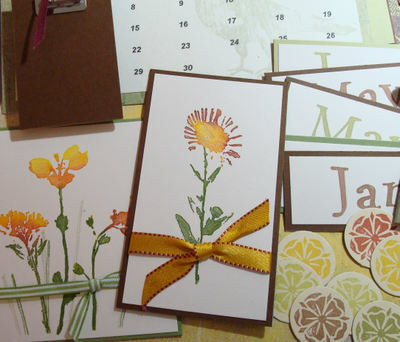 I stamped floral images on ivory cardstock. The stamps used are from Hero Arts, and colored with Marvy Markers. I tied coordinating ribbons around the images, and matted them on cardstock and then attached them to magnet sheet. At this point, I was almost done making my 2008 calendar. All I had left to do was to paint my Vertical Album. I painted it using a couple of coats of acrylic paint. I took a narrow strip of printed paper and glued it to the edge of the base of the Vertical Album. I tied the magnet board to the frame with a neutral ivory twill tape. I was now ready to see what arrangements I could make using the elements I made. This was the fun part of this project. Here are a few samples of what I came up with. Each month will have a new look! I am very happy with my new calendar. 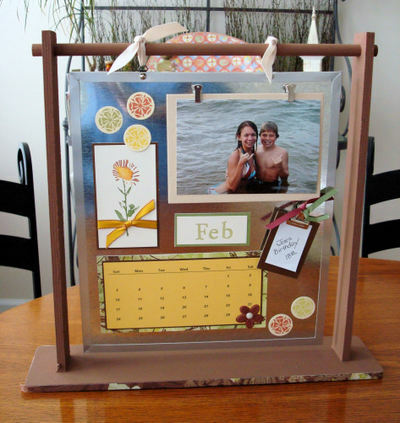 I couldn't have made it without my Glue Art & Paper Vertical Album. I know I will be using this for years to come! Well, I finished my first design team project for Glue Art & Paper Studios. We were to take their dress form and alter it to reflect our own personality and interests. I think I hit the nail on the head with this one. Once I determined that it had to reflect the gardener and nature lover in me...it was easy to create. This IS me!!! I first took the 9 1/2" dress form and primed it with a base coat of paint, and chose a soft green paint for the final color. After the paint was dry, I aged the entire dress form with a stipple brush and distress ink. It toned down the green color and gave it a vintage look. 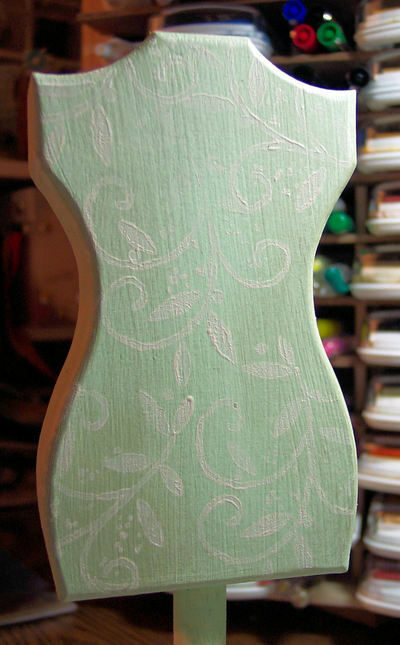 I took a flourish stamp and beige paint, and stamped the back and sides of the dress form. This gave a very soft flowing image to the sides and back. 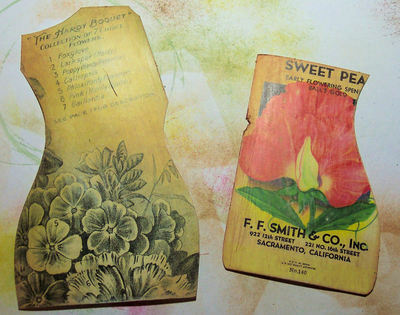 I searched for some "botanical" ephemera to use on the dress form body. I found a page from an old gardeners book and a seed packet. I simply cut the pieces to fit the dress form, by first laying the dress form down on the table (base hanging over the edge) and tracing the shape onto the papers. I cut the pieces out inside of the lines by about 1/8". Next, I aged the two pieces using sandpaper, distress inks and a stipple brush. They were ready to apply to the dress form using gel medium (you could use almost any white glue). After the gel medium dried, and I was pleased with the outcome, I decided to apply a coat of matte glazing medium over the entire dress form. I did this to seal the project, and to help add some depth to it. When it was dry, I wrapped the post with floral tape (self-stick type). Next came the really fun part for me. I was ready to embellish my dress form. I really wanted it to say who I was. I knew I had to have some flowers. 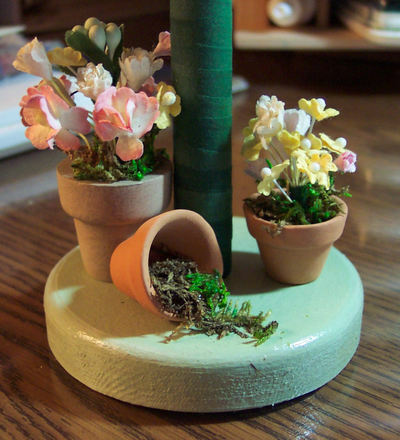 I created my "flower" garden using a small wooden flower pot (painted beige), and two miniature clay pots. The flowers are wired Prima flowers. I bunched them together, taped them up with floral tape, trimmed them to length, and added them to the pots using Diamond Glaze (again, many other glues would work fine). I topped off each pot with some spanish moss. I glued the finished pots to the base of my dress form The third pot needed some spilled soil...so I just glued some moss down directly on the base. My "flower" garden was complete. I knew my garden needed a bird to watch over it. I glued a small birds nest to the top of the dress form. 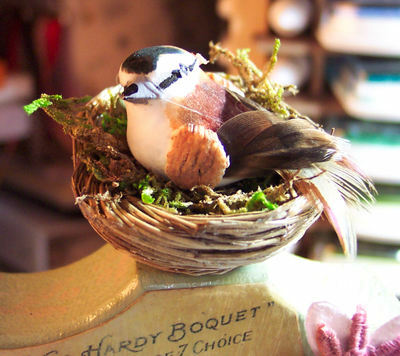 I added my miniature bird and a little moss. The final touches were to simply add some pretty hand dyed trim to the body, and an ink stained fiber flower and pink paper flower. Now you know a little more about me. I love my garden, yard and those that live it in and visit it. Flowers are a beautiful thing...forever growing and changing...nature's beauty. I have the pleasure of announcing that I've been chosen as a member of the new Design Team for Glue Art & Paper Studio. This is an exciting new challenge and endeavor for me. I am really looking forward to sharing some fresh altered projects with everyone. Thanks to Kelli and Vicki at Glue Art & Paper Studio. I can't wait to get started on my first project.